Packing light when traveling is always a gamble, hard enough to do under the best of circumstances. But when the weather turns against the Paris méteo forecast you were diligently checking every day for a week before your flight, there you are, with a well-edited suitcase full of color-coordinated mix and match clothes that now are either too warm, too light, or too wet from the rain to wear. What to do? This happened to me a year ago in Paris during a stretch of unseasonably hot and sunny May weather. No big sacrifice, to be sure, except that all I'd packed were sweaters, long-sleeve t-shirts, black pants and jeans, expecting the more typical cool and damp Paris spring. It was over 80 degrees, no AC (as we well know), bright sunshine and time to do something about it! Shopping is also no sacrifice of my time in Paris but I have enough summer t-shirts at home and didn't feel like spending a fortune. It wasn't even les soldes! 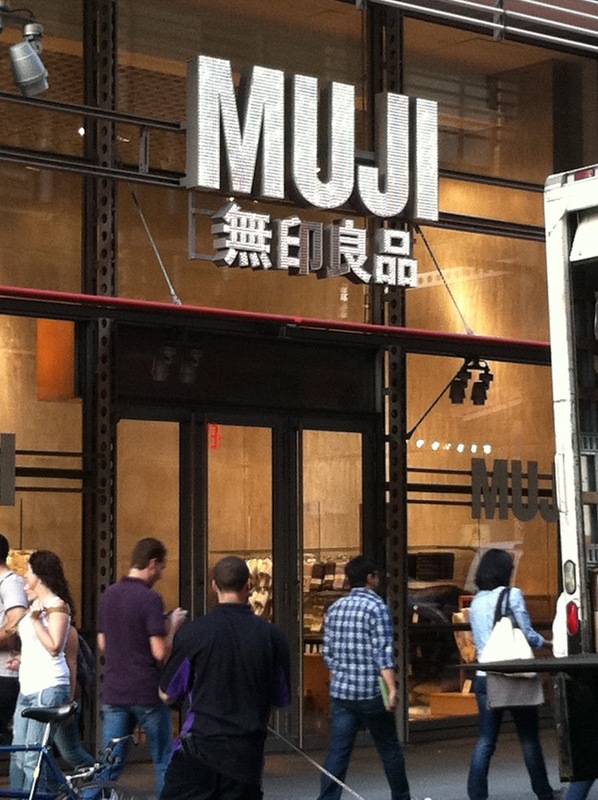 That's when I walked past MUJI on Rue St-Sulpice and saw great basic color (gray, white, black) tank tops and spaghetti strap tees in the window. 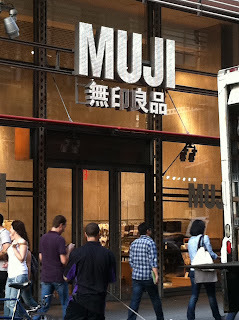 I'd never been in there, though I've since discovered MUJI in New York City. There are a few locations - in the New York Times Building near Port Authority, in Soho on Broadway and in Chelsea. 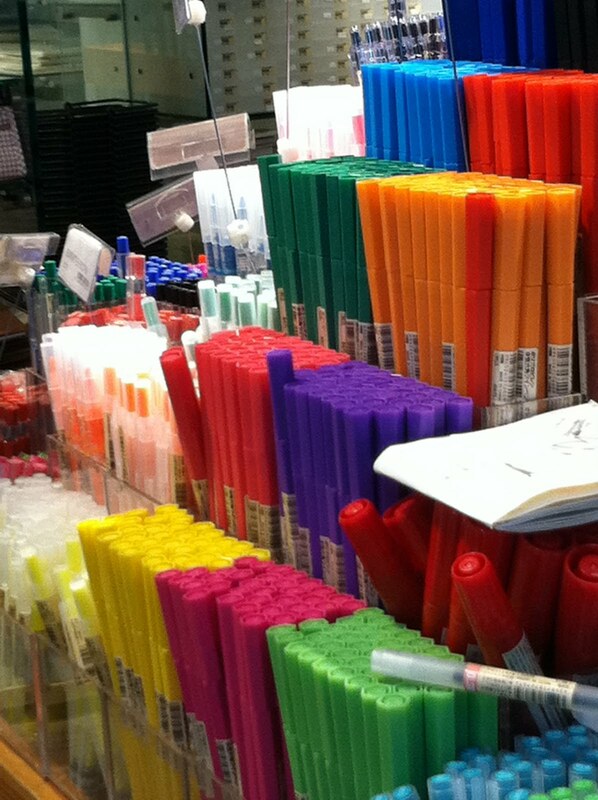 I love this store! It's like not much else - clothes are just a part of it, for both men and women. Paper things, pens (which I always love to shop for), notebooks, containers, kitchen, bath and organizing items, with a priority in style, minimalism and no-brand labeling. Originally a Japanese, but now global, store, it's a cool place to browse even if you leave with nothing. But the clothes I've purchased there are great quality for reasonable price. The tees come in 3-packs, as do undies, if you run out of those and hate to wash on vacation. All the clothes seem highly packable and great for travel, in that they tend to be in muted or basic colors, very wearable, layerable, washable, natural fibers and casual. The notebooks and pens are a fun and useful purchase for travel, and many other items there, like bags and puzzles, make great gifts to bring home or to your out-of-town host. The predictability of unpredictable weather when traveling now has a fairly inexpensive solution (at least in Paris, New York and loads of other cities around the world).